Small footprint takes up very little space. 33.6 Kbps modem for fax transmission of about 3 seconds per page. JBIG compression for faster transmission. Alphanumeric (QWERTY) keypad built-in to device. Auto-reduce incoming faxes to fit loaded paper. Memory that never disappears. No battery backup required. Maximum paper capacity of 250 sheets. Prints at up to 10 ppm and 600 dpi resolution. Walk-up copying at up to 10 ppm with reduce/enlarge from 25% to 400%. SMS (Short Message Service)* available. Maximum duty cycle up to 1,000 pages per month. Speedy 33.6 Kbps modem for fast fax transmission in as little as 3 seconds per page. up to 10 ppm convenient walk-up copying with reduce or enlarge original images from 25-400%. Direct-connect printing is fast, high-quality 600 dpi resolution. Compact and smart design for convenience and accessibility. Small footprint takes up very little space. Set it on a shelf or desk within arm's reach. When receiving data, the F110 automatically reduces a document to fit the loaded paper size in tray. Large-capacity paper tray can handle high-traffic. Robust features that are a cinch to get the hang of. Simple to set up and configure. Protected memory, saved faxes and device settings are never lost if power is interrupted. Text messaging (SMS) to fax for communication convenience. Alphanumeric (QWERTY) keypad makes it a breeze to create cover sheets from the device and program settings. High-speed fax at 33 Kbps reduces call duration so you save on your phone bills. JBIG Compression for faxes provides 20-80% efficiency in compression making the transmissions much faster. Time-Deferred Sending, so you can send faxes when the toll-rates may be lower. Energy Star Compliant, which means you save on energy costs. Broadcast Transmission of your faxes to a group from your telephone book with a single scan. Protected memory means that you never have to reload the device settings and you won't lose saved faxes. High-speed fax combined with JBIG compression makes the transmission of faxes much faster reducing call duration. Optical Character Recognition & Image Editing Software is included to convert scanned images into editable text documents. SMS (Short Message Service)* allows sending and receiving of messages to a mobile phone, email or fax machine directly from this device. Protected Fax Reception, a security feature that prevents faxes from being printed till a code has been entered. Lock the machine to prevent unauthorized persons from using the machine. You can lock either the entire keyboard or the number pad of your fax machine. 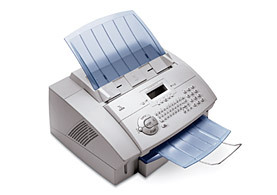 Printing Multiple Copies of fax transmissions upon reception automatically. PaperPort and OmniPage scanning software from ScanSoft to help digitize and organize your documents. * Depending on availability in particular country and telephone networks.